These are lyrics by Goo Goo Dolls that we think are kind of repetitive. 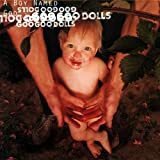 Goo Goo Dolls', "What a Scene"
This song is really cool, but they repeat that at least 11 times. Lets see, multiply 17 by 11... oh god!!!! 127?!?!?! how could Robby stand repeating one thing over 100 times in one song?! I mean sure Johnny's the frontman but god!!! Robby stand up for yourself!! You used to be the frontman and you're a year older than him, that should be no problem!! !